August 23 is the National Sponge Cake Day. This food holiday is devoted to one of the simplest and oldest forms of cake which as been around since the 17th century. A sponge cake is so named due to its firm, yet well aerated structure, that resembles a sea sponge. It is made with flour, sugar, and eggs. Some recipes include baking powder as a leavening agent. The so-called Victoria sponge contains additional fat (usually butter). The key to making a perfect sponge cake is the technique. The batter needs to be beaten very thoroughly in order to create the necessary volume. A sponge cake is typically made in the following way. First, eggs are beaten with sugar until light and creamy. Then flour is carefully sieved and folded in. Sometimes, eggs are separated. 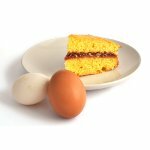 Yolks are beaten with sugar while whites are beaten separately to a foam and then gently folded in. It is important to incorporate air into the batter. Keep in mind that if you remove the cake from the oven too early, it will lose the air. The sponge cake technique is used to make different desserts such as Swiss roll, Yule log, madeleines, ladyfingers, trifle, strawberry shortcake, Angel food cake etc. To celebrate the National Sponge Cake Day, try your hand at baking a sponge cake or buy one from your favorite bakery.